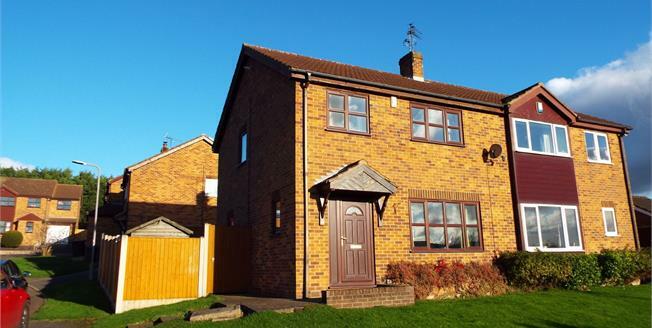 This three bedroom, semi detached property is certainly a must view. Boasting a welcoming entrance hall, spacious lounge/diner and kitchen to the ground floor. To the first floor are three good size bedrooms and a spacious family bathroom. Outside there are gardens to the front, rear and side due to it sitting on a corner plot. There are also double gates which lead a driveway. UPVC double glazed front door. Double glazed uPVC window facing the side. Radiator, wood flooring, under stair storage. UPVC double glazed door to the side. Double glazed uPVC window facing the rear. Tiled flooring. Roll top work surface, wall, base and drawer units, stainless steel sink with mixer tap and drainer, integrated, electric oven and gas hob with stainless steel extractor hood over, space for dishwasher, washing machine and fridge/freezer.